Waiting for the root access for your AT&T or Verizon Android phone? Then there is really a Great News for you! Geohot (aka George Hotz) - a famed cracker who was responsible for hacking the PlayStation 3 and subsequently being sued by Sony - has built and released a root tool called Towelroot on Sunday night that will let most Android smartphones users to root their Android device with one click only, as long as it has an unpatched version of the Linux kernel. Towelroot application exploits the same vulnerability (CVE-2014-3153) which was recently disclosed by the hacker Pinkie Pie in the Linux kernel version 3.14.5 and most versions of other Android devices, which could be leveraged by hackers to potentially acquire root access on affected devices. Having root access of your device simply means you make System-level changes to your device such as accessing and modifying any file or program using any mode (single- or multi-user). It is just like operating an administrator account on a computer. Also some users have even reported its success with the all time favorite company of GeoHot, Sony Xperia SP C5303. Geohot became famous for being the first person to carrier unlock the original iPhone in 2007 and later for creating the limera1n jailbreak tool for future versions of the iPhone. He gained fame after subsequently hacking the software of the PlayStation 3 console, thereby opening up the ability to add homebrew and play pirated games, for which he was taken to court by Sony. 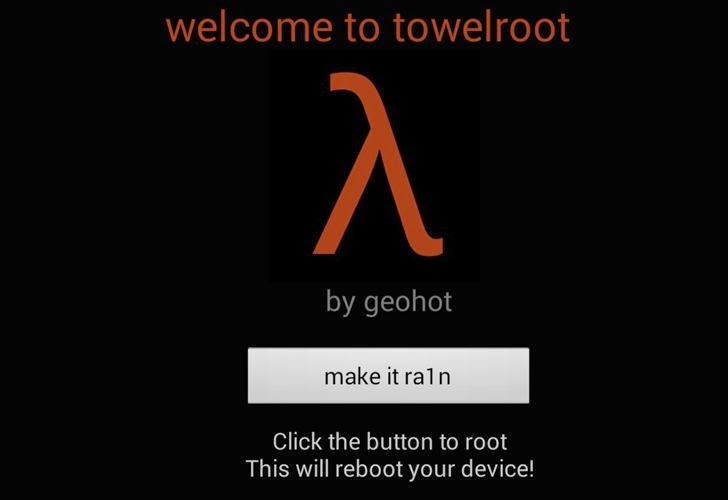 Step 1: Download Android Rooting application from towelroot.com and install it. Step 2: While Installation you might receive warning message saying that Towelroot "contains code that attempts to bypass Android's security". Just hit Install anyway after selecting the checkbox: "I understand and still want to install it". Step 3: Once the Towelroot installation completes, launch the application and click the button reading "make it ra1n" and it will force your device to reboot. Step 4: After the device reboots to home screen your phone will be rooted with its bootloader unlocked. Cheers! Along with the Android users who were itching to get Android rooting technique for their devices and doing tons of things such as customizations, patching apps and installing third-party ROMs, the new tool will also allow cybercriminals as well to gain administrative access to a victim’s phone. Specifically, at the same time the cyber criminal with the administrative access could potentially run malicious code, retrieve files, bypass third-party or security applications including containers like Samsung’s secure Knox sub-operating system, and place backdoors for future access on users’ devices. $18000 BOUNTY GOES TO GEOHOT OR PINKIE PIE? Till now, the developer edition of Samsung Galaxy S5 for Verizon and At&T have not receive root, for the reason XDA members started up a Crowd funded Bounty program, now valued at over $18,000, for achieving the root on Verizon and AT&T Samsung Galaxy S5 devices. So, now the question is Who gonna fetch this raised bounty by XDA developers? On one hand, where the famed developer George Hotz (GeoHot) have developed the tool to root Samsung Galaxy S5 (Verizon and AT&T) and other Android devices, on the other hand Pinkie Pie have discovered the vulnerability exploited in the rooting tool, TowelRoot by GeoHot.